It’s exciting! It’s fun! It’s a blast! You and your children are invited to an afternoon of great fun and excitement as we host our annual Children’s Easter Celebration. 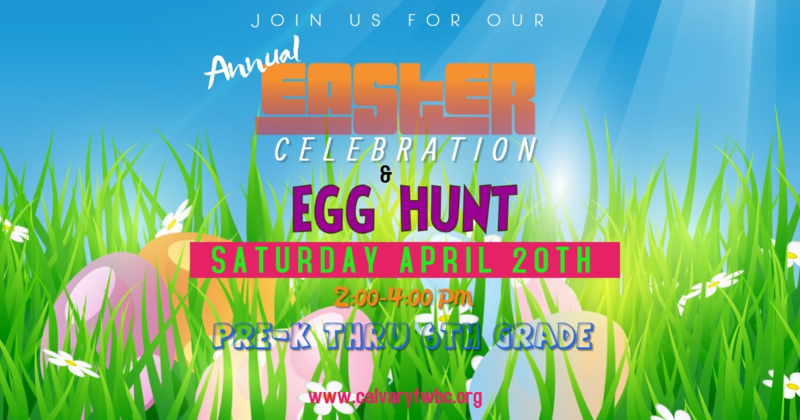 Geared for Pre-K through 6th grade, your children will be engaged in games, crafts, a prize-winning Easter egg hunt with more than 1,000 candy filled eggs, food, candy, and most importantly, they’ll hear a special message regarding the true meaning of Easter. Lunch will be provided for everyone who attends. So kids, bring your Easter baskets, your running shoes, and an open heart to experience God’s wonderful love!